Create and edit plain or CSS-styled text links or inline buttons instantly. Choose foreground and background colors, underlining, radius, glassy effect, and animation. Also set link path, target, and title. Create or edit groups of CSS-styled buttons in either horizontal or vertical lists. Choose foreground and background colors, underlining, radius, glassy effect, and animation. Also set link path, target, and title. 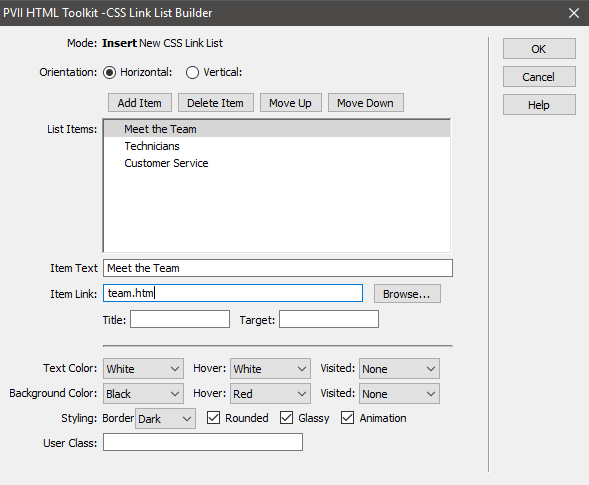 The Links Toolkit comes with 2 user interfaces. 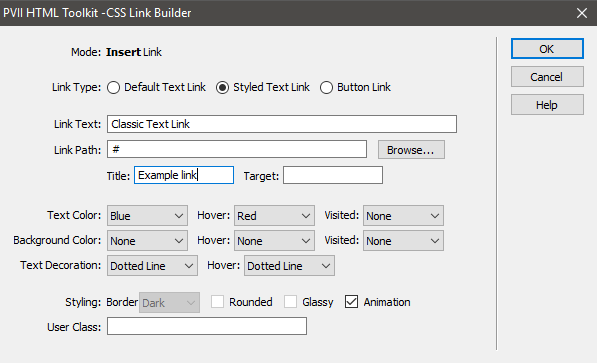 The CSS Link Builder UI facilitates styling and setting regular text links or buttonized links. The UI can also be used to quickly set or edit the link path (HREF), title attribute, or target attribute of your link. The CSS List Builder UI lets you quickly set up styled lists of buttonized links in either horizontal or vertical orientation. Set, style, and manage links just the way you want, from inside a logical interface inside Dreamweaver. There are 18 colors and hundreds of combinations. Basic text links do not need to be boring. Perhaps you want to set a background color on text links just for effect. Right on! Red on White is bright— just you wait and see. Gray over Blue is Timeless, and easy to identify. Traditional Blue is you. Of course, the Link Builder UI lets you quickly set up and style classic text or buttonized links in record time. There 's a lot to be said for a flat look. Timeless. Elegant. PVII CSS Link Builder makes quick work of styling links. Let's look at some more button effects. Measured against other tools, PVII Extensions have no equal. We make Dreamweaver better.